Was Romney a tax cutter or a tax hiker? As governor of Massachusetts, Mitt Romney closed a big deficit with a mix of spending cuts and revenue increases, but he never raised tax rates. NEW YORK (CNNMoney) -- Mitt Romney has portrayed himself as a tax cutter when he served as governor of Massachusetts -- slashing taxes 19 times. The Obama campaign put out an ad on Thursday claiming that he broke a promise to lower taxes. This is politics, so there is hyperbole on both sides. And there's always disagreement about what can be categorized as a tax increase or cut. The bottom line is that Romney cut some taxes as governor. But he also faced a big budget deficit when he took office in 2003, so he raised revenue as well. The cuts: Among Romney's cuts was a one-year delay in a capital gains tax increase enacted before he took office. That resulted in a one-time savings of $250 million for Massachusetts taxpayers. --and a deduction for businesses that install automatic sprinkler systems. He also extended or made permanent some temporary tax breaks and signed into law two sales tax holidays, each of which lasted a day or two. The Romney campaign did not provide an overall estimate of how much the 19 measures saved taxpayers. And the independent Massachusetts Taxpayers Foundation didn't have one. The new revenue: But since the tax cuts were relatively small, the revenue taxpayers saved was "vastly less" than the roughly $700 million in additional annual revenue the foundation estimates was raised because of other measures Romney signed, according to Michael Widmer, the foundation's president. Romney's opponents call many of those measures tax increases; he says they weren't tax increases but rather corporate loophole closings and fee increases. "A loophole is when someone takes advantage of a tax law in a way that wasn't intended by the legislation," Romney said at a campaign stop in Iowa last summer. He noted that when he took office some Massachusetts banks were calling themselves real estate companies and getting a special tax break intended for real estate enterprises. "We said no more of that. 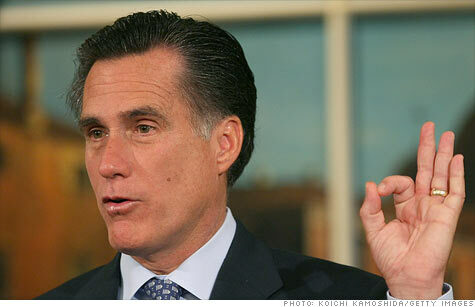 You're not going to game with the system," Romney said. But Romney did more than close loopholes, Widmer said. For example, he noted, the state's revenue commissioner was given unprecedented power to scrutinize corporate returns and decide if a transaction may have been engaged in strictly for the tax benefit rather than a business-related reason. As for fees and penalties, sometimes they're just that. For instance, Romney increased the penalty for engaging in abusive tax transactions, said Kathleen Thies, a state tax analyst for tax publisher CCH. But some of Romney's moves were a direct bid to boost revenue, especially in his first year when he needed to close a $2 billion budget gap, Widmer said. A number of fees affecting individuals went up, including fees on home buyers and various license fees. Romney also proposed several new fees. "I think there is an argument to be made that these changes were, in fact, tax increases. However, since they were not rate increases per se there is more wiggle room," Thies said. The Obama campaign ad plays a clip of Romney promising that he would not raise rates and that he intended to bring them down by the end of his first term. Indeed, during Romney's tenure, individual and corporate income tax rates did not go up. Nor did they go down, however. Romney had proposed a lower personal income tax rate in 2006, although he didn't specify how to pay for the revenue loss. And in any case the state legislature did not approve Romney's proposal, Widmer said. The verdict: Gov. Romney cut select taxes while in office. And he even proposed some new tax cuts that didn't pass the legislature -- like a 0.3 percentage point reduction in the 5.3% state income tax rate. But he also had an obligation to balance the state's budget every year, and when he came into office he was facing a big deficit that he plugged using a mix of spending cuts and revenue increases. "He solved for a $2.1 billion problem. Half of it came from revenue," Widmer said. "He brought a balanced approach." The revised tax plan Romney has proposed in his bid for the White House would cut today's individual income tax rates by 20%, reduce the corporate rate, eliminate investment taxes on the first $200,000 in income and kill the estate tax. It would also limit the value of various tax breaks, although the campaign has not offered specifics. Romney's plan is intended to be revenue-neutral, but it's impossible to confirm that unless he releases details on how he would curb tax breaks. As is, the plan would reduce federal revenue by an estimated $480 billion in 2015 relative to where rates are today, according to an analysis by the independent Tax Policy Center. --This article is an updated version of a similar one that appeared in January.